Why am I blogging? To connect to the crafting world outside of my little town. It's nice to see all the visitors to the site & (hint, hint) I like getting comments! They have names - Bloopy, Cara-loopy and Floopy and an entire mythology is building around them as we speak - even a superhero they are all fans of: Blooperman. 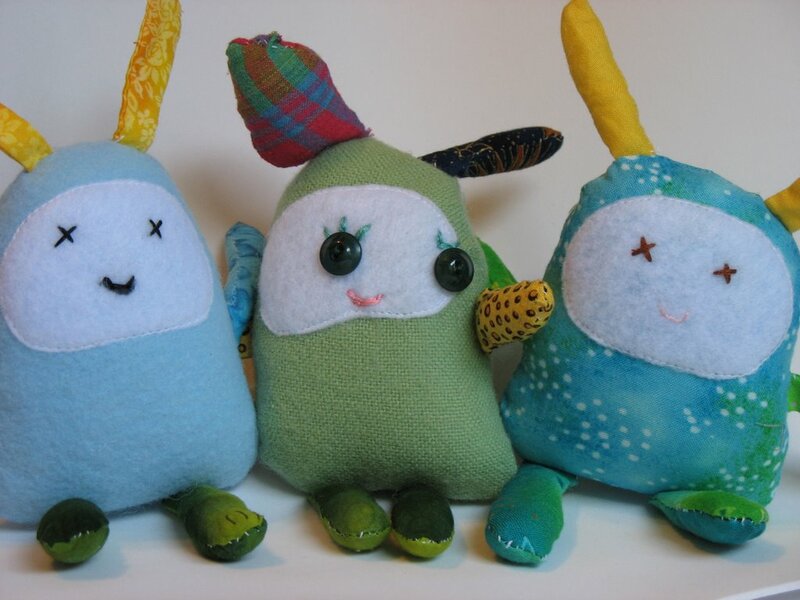 We spent the entire day making them and it was lots of fun - the girls (9 & 11-year olds) sewed 90% of them by hand! I love the idea of posting pictures and sharing crafts online... I have tons of pictures on my camera - I've just got to work at this on a more regular basis. So, postal mishaps - this is unbelievable... I have only once, a couple of years ago, had trouble with a package being damaged, and items missing... well, as they say: "When it rains it pours" (and I am not talking about the incessant precipitation we're having!) Last week, a package I sent to CA was delivered empty. The stuffed doll heads I sent were later found at the post office, one of them even ripped open (the DEA?) Then, yesterday, I inquired at a site about an item I had ordered in June - they mailed it over a month ago and I never received it! Today was the icing on the cake. I received an email about another item I had ordered weeks ago from a blogger out in Oregon & surprise! She just found my order, mislaid, and it will be sent out pronto. Well, I should have figured. I'm not upset... I'll look at it as more suspense until the items arrive. Does anyone out there check out the links of bloggers they like? Should I put up links that I visit on a regular basis??? Does anyone care? Yes! You should definitly put some links up to the blogs you like looking at. I find it's a nice way to find new blogs and it's good to see what inspires people or what they like to read. Hey nice Moopys! I made some on the weekend too. They're fun aren't they.